Short-Term Tips Providers are Frauds! Some of the subscribers raised a question to us: Why cannot we provide short-term Options & Futures tips? Let us put our thoughts on how we concluded like that. People sell service or products to earn Money. People won’t sell Money to make Money! The Daily Trading, Weekly Options & Futures are Tips of Very-Short-Term nature. Some of the providers even guarantee 50% to 100% returns in very-short-term. If they are sure of making 100% money on a capital, then Why they are selling them? They can use the tips to trade themselves & make money. Right? Why they do not they trade themselves? They are not sure of their tips. Then, why they are selling it? People are greedy out there to get rich quickly. You can take the simple example, You are sure that a Tip-Provider will be having 1 Lakh Capital to start the business, Let them be ambitious about their tips providing 100% returns in a month – which is guaranteed by any tips-providers over India. After 1 Year they have 2 Crores after Tax. They can buy a BMW and roam around. Every 5 Years, You will see Mighty Millionaires than Ambani! Some Tips Providers justify that they are doing a Service! Then, Why they are taking fees? Service should be free. Right? If a=b+c; then b should be a-c. Right? Trading, Options & Futures requires Dedicated time, energy & infrastructure to track elephant-moves of the market. Clearly, we do not have such resources now & cannot provide Short-Term tips. 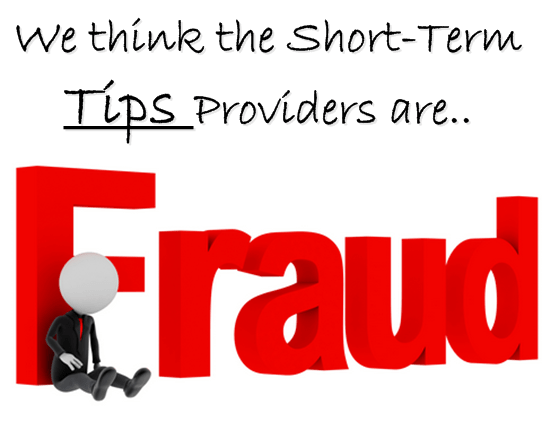 Short Term Tips Providers are mainly frauds. Keep an exit limit of capital & do not over-trade. Many of the Tips Providers today were using another company name few years back. They are looting people over the years through different names. Deviational Thought > Long Term Tips Providers have higher authenticity. Long Term Wealth Creation is the original purpose of Stock Market.